Alexis Claude Clairaut (13 May 1713 – 17 May 1765) was a prominent French mathematician, astronomer, geophysicist, and intellectual. Clairaut was born in Paris, France, where his father taught mathematics. He was a prodigy — at the age of twelve he wrote a memoir on four geometrical curves and under his father's tutelage he made such rapid progress in the subject that in his thirteenth year he read before the Académie française an account of the properties of four curves which he had discovered. When only sixteen he finished a treatise on tortuous curves, Recherches sur les courbes a double courbure, which, on its publication in 1731, procured his admission into the French Academy of Sciences, although he was below the legal age as he was only eighteen. In 1736, together with Stokes showed that Clairaut's result was true whatever the interior constitution or density of the Earth, provided the surface was a spheroid of equilibrium of small ellipticity. 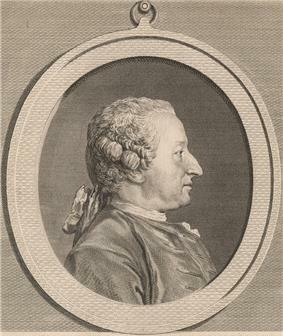 He obtained an ingenious approximate solution of the problem of the three bodies; in 1750 he gained the prize of the St Petersburg Academy for his essay Théorie de la lune; the team made up of Clairaut, Jérome Lalande and Nicole Reine Lepaute successfully computed the date of the 1759 return of Halley's comet. The Théorie de la lune is strictly Newtonian in character. This contains the explanation of the motion of the apsis which had previously puzzled astronomers, and which Clairaut had at first deemed so inexplicable that he was on the point of publishing a new hypothesis as to the law of attraction when it occurred to him to carry the approximation to the third order, and he thereupon found that the result was in accordance with the observations. This was followed in 1754 by some lunar tables, which he computed using a form of the discrete Fourier transform. Clairaut subsequently wrote various papers on the orbit of the Moon, and on the motion of comets as affected by the perturbation of the planets, particularly on the path of Halley's comet. His growing popularity in society hindered his scientific work: "He was focused," says Bossut, "with dining and with evenings, coupled with a lively taste for women, and seeking to make his pleasures into his day to day work, he lost rest, health, and finally life at the age of fifty-two." He was elected a Fellow of the Royal Society of London in November, 1737. ^ O'Connor and, J. J.; E. F. Robertson (October 1998). "Alexis Clairaut". MacTutor History of Mathematics Archive. School of Mathematics and Statistics, University of St Andrews, Scotland. Retrieved 2009-03-12. ^ "Library and Archive Catalogue". Royal Society. Retrieved 22 December 2010.